The Atacama Desert in Chile is the world’s driest place on Earth. There’s very little for human beings out there — unless you’re a scientist looking for a place that bears resemblance to Mars. Right now, NASA is using the desert’s harsh climate as a testing ground for some of the instruments it will use on future Mars missions, including the technology that could help find signs of life on the red planet. NASA’s Atacama Rover Astrobiology Drilling Studies (ARADS) just finished its second season of tests for robotic missions on Mars — another month-long round assessing the life-detecting instruments on its practice rover, KREX-2, as well as collecting data on how life developed and survived in the desert. “These are middle to more mature instruments that have a chance of going to Mars in the next five years,” Brian Glass, a NASA Ames space scientist and the principal investigator of the ARADS project, tells Inverse. The KREX-2 rover carries a two-meter drill and a robotic sample transfer arm. 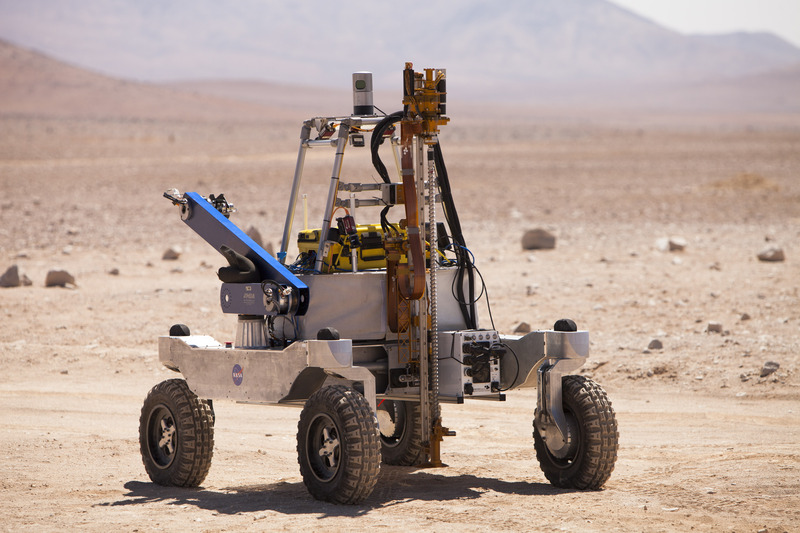 The KREX-2 rover, which was developed by NASA’s Ames Research Center in California’s Silicon Valley, has a two-meter drill and a sample transfer arm. Researchers also tested three life-detection instruments, which are fed samples from the transfer arm to look for signs of extraterrestrial life. This technology will be used for robotic missions that visit Mars before humans do, helping humans find the best place to land, study, and search for life. During this test, scientists were able to successfully use the rover to drill up to two meters and acquire samples to analyze signs of life. NASA chose the Atacama Desert as a test drive spot because of its extremely dry and arid conditions, and its intense exposure to UV radiation. It is maybe the closest thing to a Martian environment found on Earth. The little life that exists in the desert must be able to withstand extreme conditions, and most of them are microbes that live underground or inside rocks. Scientists believe that if there is life on Mars, it would probably live underground because of the surface dryness and radiation exposure. In the desert, NASA the three life-related instruments NASA tested were the Wet Chemistry Laboratory, the Signs of Life Detector, and the Microfluidic Life Analyzer. The KREX-2 rover navigates autonomously in the Atacama Desert. The Wet Chemistry Laboratory was developed by NASA’s Jet Propulsion Laboratory and used on the 2007 Phoenix mission to Mars. It can identify chemicals in a biochemical context. This tool, along with the Signs of Life Detector from Spain’s Center for Astrobiology, was used in the 2016 tests and re-tested this year. The Signs of Life Detector is similar to home medical tests. The instrument will search for 512 different biological compounds like amino acids, RNA, and long strand polymers, similar to how diabetics monitor their blood sugar with a device that detects glucose. The Microfluidic Life Analyzer from the JPL made its first field test this year, and it processes small volumes of fluid samples to isolate amino acids, which are the building blocks of life. NASA also unofficially tested a DNA sequencer, which pulls out DNA strands and analyzes electrical signals. The agency plans to test a laser desorption mass spectrometer from the Goddard Space Flight Center in a future trial. While the other three tools search for life that’s similar to Earth-based life, this tool can detect unusual signs of life that are not DNA-based or amino acid-based. This tool is slated to go on ExoMars in 2020. There will be two more annual tests through early 2019. In next year’s test, the rover will actually carry and operate the life-detection instruments, as well as use the drill tested this year. “Working together, these four instruments would be a reasonably potent package for life detection,” Glass says.